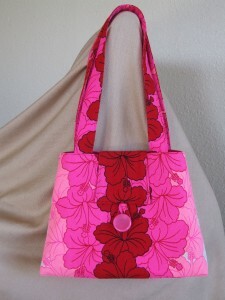 This bag was made from a fantastic vintage Hawaiian dress in need of repurposing. You can see why it caught my eye at the local thrift store. And it happened to be all-clothing-for-one-dollar day. After finishing the bag I wished I’d taken a picture of the dress, to do a sort of before and after, and also to honor the dress. I might start getting pictures of my treasures in need of transforming. I love giving this fun fabric a second life! Happy Valentine’s Day. 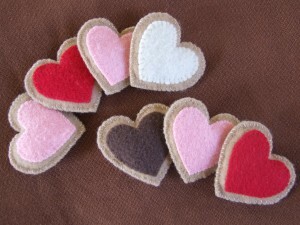 Here’s a picture of some felt heart cookies I made for the kids last year. I too wish I’d seen the dress 1st, but what a fabulous bag it made!!! Great price of the original materials too!! !